o I was leaning against a wall warmed by the sun and reading a dog-eared copy of Keats’ poems. I have visited the house in Rome where he died – the Keats-Shelley Museum – many times, and each is profoundly moving in a different way. That is why I return when I’m in Rome. It’s my sort of pilgrimage. Outside is the chatter from one of Rome’s most convivial spaces – the Piazza di Spagna with the Spanish Steps forming one side of an open air theatre. Keats took lodgings in a building on one side of the steps; on the other the ‘milordi inglesi’ would, in 1821, have congregated at the Caffe degli Inglesi where they would pick up letters with news from home and bills of credit, the equivalent of cheques. In Keats’ time, the Grand Tour was still a necessary part of a young man’s education. Women had to be chaperoned. he winter in Rome that the climate could favour a person with tuberculosis. When Keats arrived in September 1821 with his faithful companion, the painter Joseph Severn, it was cold and damp. From the small bedroom where Keats died, you can look out over the steps and down to the large oval fountain designed by the sculptor Bernini’s father with sinuous curves and plenty of flourish. Horses and carriages still wait there for custom, much as they would have done then. What is so moving about seeing the same buildings, being in the same space? All the furniture was burnt after his death as decreed by law. All the exhibits have been bequeathed over the years. There are so many objects in glass cabinets and on walls that one feels one will never have enough time to look at them. But there is also a small open area where one can sit and read the poems, written by one who died aged 25, and wonder whether, had he lived, we might have inherited as great a literary figure as Shakespeare. ‘I am certain of nothing but the holiness of the Heart’s affections and the truth of the imagination – What the imagination seizes as Beauty must be truth…’ he wrote to a friend in 1817. I admit I was amazed when a friend told me she never read novels because they weren’t ‘true life’. Was she thinking of that pernicious use of fiction as untruth? She talked of biographies and history as being ‘true’. How much of what she read was based on documentary evidence, I wondered. Precious little. Historians have to conjecture. But imagination carries you far beyond of self, right inside the lives of others – Anna Karenina, Charles Bovary, not to mention his wife, Dorothea in Middlemarch, who could feel all who had come before her speaking as if through the soles of her feet as she trod the earth. He wrote this poem in May 1819. Fifteen months later he was in Rome and in less than two years, he had died. 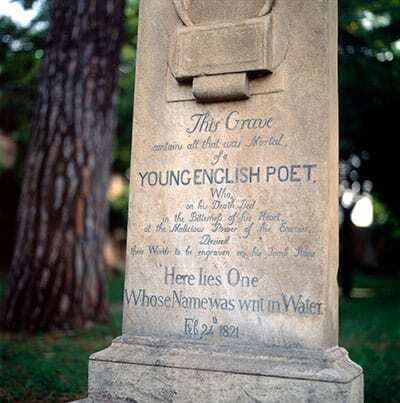 Severn honoured that wish, as the gravestone shows – Keats is commemorated just as ‘A young English poet’.